After rain had left the region, I opted to head to a slightly higher base elevation. 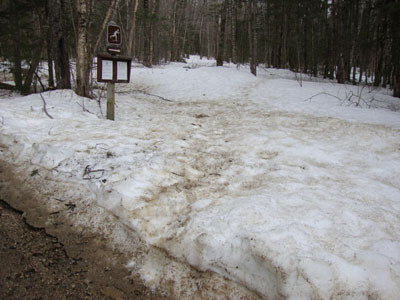 Starting at the Doublehead Ski Trail trailhead, there was a good foot or more of snowpack - and plenty of minor blowdowns. 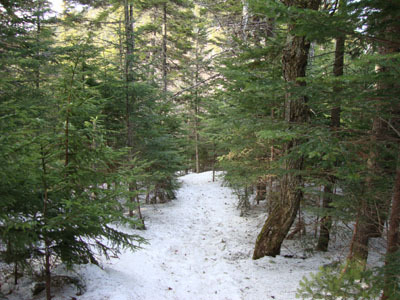 Hopping onto the Old Path, I worked my way up the steep mountainside in decent spring snow conditions, taking a right and heading to South Doublehead. 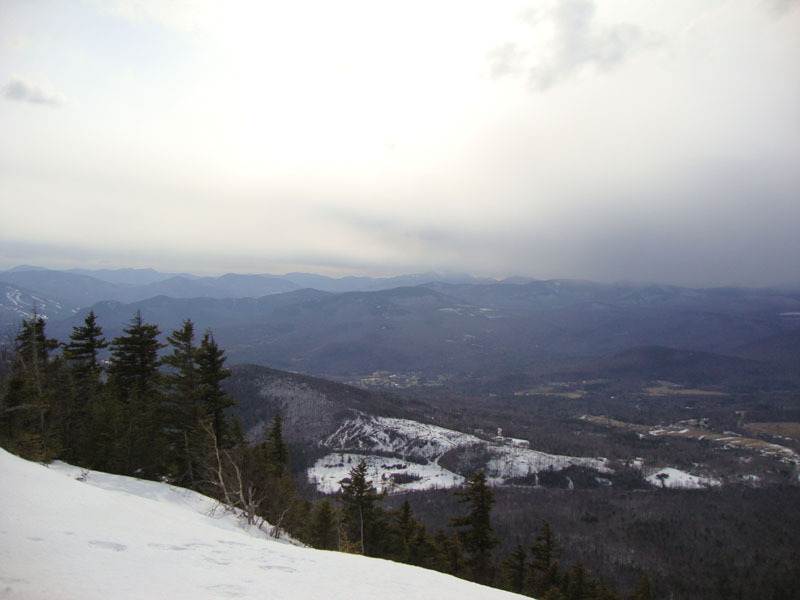 Though good, the views weren't spectacular, as clouds were moving in, obscuring the high peaks. 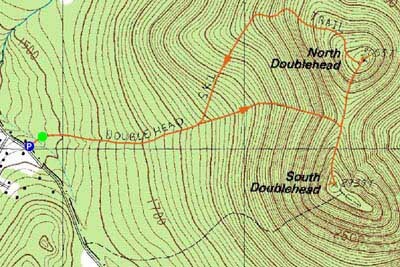 Back in the col, I headed up to North Doublehead. 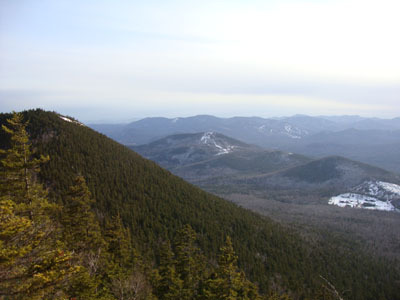 My first stop at the summit was to the eastern viewpoint, were I had a nice look at the Maine peaks and Mountain Pond. 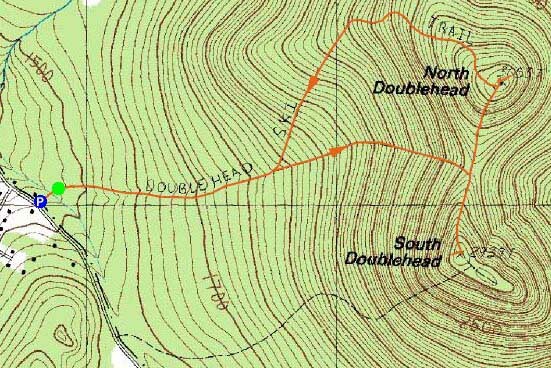 Having heard of (and having seen) ledges on the southwest side of the peak, I looked around for a spur path, but found none. After doing some bushwhacking, I found myself on the ledges, with a slightly different perspective than the main viewpoint at South Doublehead. This viewpoint reached further south (though it lacked the northern view). I particularly liked the view of the old Tyrol ski area. Certainly worth a return trip. 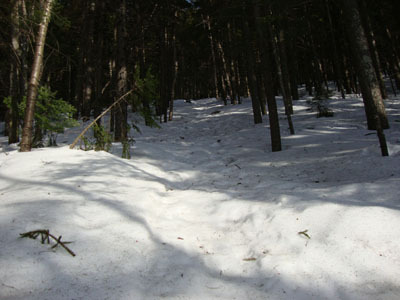 Back on the ski trail, I took the time to remove a bunch of small blowdowns, hopefully rendering the trail a bit more skiable. While the lower waterbars and minor brooks were open, they were still fairly easily crossed.